Social media platforms are the new age public meetup venues where people can meet new ones, chat up with each other, get to know about new information & decide whether to accept things or not. And this social media venue set up has extended to almost all fields of our life including business. The modes of business have changed a lot from how it was years ago and more & more businesses around the world are waking up to the fact that their customer’s buying decision process is changing. Today’s customer doesn’t want to be felt that products are being sold to them. Buying has turned to become more of an experience. Social media is having its power of influence in both B2B & B2C sectors. But still there are marketers who believe that social media in business is solely a ‘consumer thing’ which is a misperception caused by the fact that most research focuses on social channels & evolutions in B2C markets. But contrary to that belief B2B decision makers are using social media across their B2B buying journey. Let’s refresh the page to know how customer behavior have changed and how exactly Social Media influences B2B purchase decisions. Buying & selling has always been a part of the business process. Historians trace the origins of trade to the very start of transactions in prehistoric times. Earlier transactions which happened through the process of barter system, which still exist in some parts of the world, are proof that apart from self-sufficiency, trading is a principle facility of Mankind. Now let’s see what exactly constitutes the buying & selling part. A person buys a certain piece of commodity or a service in exchange for something of value. The mindset of the buyer that comes in to play during the transaction influences the whole process. This is the very concept of purchase decision. Purchase decisions vary according to the nature of the transactions. If a person is buying toothpaste, the purchase decision will be minor while other purchases like buying a car, the purchase decision will be major. The effort put into process will increase as the purchase decision becomes more major. Now there are certain factors that influence this purchase decision. It can be regarding how much information the person can attain regarding the product or just following the crowd. It can be with regards to peer reviews or may be because of emotional reasons. Knowing and understanding the pulse of the customer & utilizing that knowledge of where to strike while the marketing the product, defines the success of the seller. This is applicable in B2B or B2C or whatever market is out there. Now in today’s world there is nothing like social media that influences the mind of public. It’s a sin if marketers are not utilizing these platforms for connecting to the customers. ‘Connected consumer’ is the new breed of consumers that rely heavily on digital and social technologies and in the B2B sector we have ‘Social B2B buyer’ who are a group of heavy social media users. And it’s said that social media will influence will grow only in both sectors. What the marketers should keep in mind is that B2B buying journey will be more of a collaborative one which will include group discussions involving multiple stakeholders and decision makers. So the approach should also be in a way that is suitable for the B2b business unlike the B2C one. Enough with the storytelling & let’s get in to business. Let’s see in which all ways Social media influences the rough & tough B2B buyers and how marketers should leverage them for attaining success. Having presence in the social media is the first step in using social media to influence the buyers. Primarily this will help your customers who are active on social media platforms to find you. This will help in increasing your brand exposure and awareness. If you are having a strong presence in the social media platforms by providing information regarding your product, updating activities regarding your company customers will also be attracted to your brand as its human tendency to follow & respect authority that is earned. Having presence in the social media platforms will also let you run campaigns and advertisements for getting new opportunities. It’s a great way to build audience by posting & engaging with users across the social media platforms which will increase the chances of converting potential clients, partners & influencers to join your business. Marketers around the world understand the importance of content in marketing and advertisement. Social media provides enough channels to promote your content to audience in wider perspective & you can use your connections to get help to your pieces of content. You can provide your company’s blog, website content etc. through the social media channels but you should ensure that quality content is being posted. Today content isn’t just confines to words but can also be expressed in the form of images, videos or even podcasts. Having a proper strategy is what marketers must focus on while using content in the B2B segments. They should plan accordingly in determining the content quantity & type according to the particular social media platform that is going to be used as per the need and occasion. By doing all these, it makes it easier for your prospective B2B customers to understand the nature of your business, how you are promoting your products and how useful it will be for them if they avail your services. Buyers use different channels at different stages of the buying process according to (Buyersphere Report). The researchers have divided the buying process into 3 different phases which are Identifying and defining the need (Awareness stage), Identifying potential suppliers (Consideration) and final supplier selection (Conversion). As per their research, Facebook and blogs are most useful in the first phase of the process while LinkedIn and blogs are the most effective in the second phase. Twitter and Facebook are most useful in the final stage of buying. It’s necessary for the company to have a well-known presence in all these mediums for actively pursuing customers in all these stages. Its human nature to follow the advice of authority figures especially if they have more experience in the particular field. Influencers are notable personalities in the online world who will be having a huge fan following because of the authority they have gained by demonstrating their skills in their respective fields. These influencers can be hired by corporates for promoting their brand or products. But whether or not the influencer’s posts are sponsored, their content will be having large effect on purchasing decisions. Other benefit of attaining the help of influencers is that they will bring fresh content for your business which will be more beneficial for you as they will be focusing more on providing information to their followers rather than trying to sell the product. Marketers should reach out to influencers according to their respective industries and see if they would be willing to try your particular products and share their experiences on social media. You can check out our blog posts regarding B2B sales influencers & B2B content marketing influencers to get to know some of the current top influencers in the industry. These are some of the key ways of how Social Media influences Buyer behavior in the B2B industry segment. 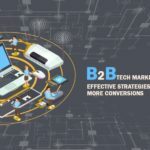 Social media is one platform that marketers in the B2B industry should explore to gain the confidence of their prospective buyers for converting them to leads. With a solid strategy in place, B2B brands can effectively reach their customers using social media platforms.